I’d like to share some photos of this rather special Petite Metisse-Triumph that has been put together by fellow Sunbeam enthusiast and engineer extraordinaire Tony Pashley. 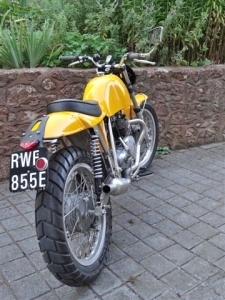 The bike was initially a 1967 Petite Metisse scrambler powered by a 250cc Bultaco engine. Tony clearly wasn’t happy with this state of affairs and, being well known as author of “How to Build Motorcycle-engined Racing Cars”, he had the skills to do something about it. This book is the industry standard text for builders of hill-climb and sprint cars condensing many years of building and racing experience. A decision was made to create his own dream bike based on an idea he had back in the mid ’60s, a time before he had to give up scrambling for more serious things. With Tony’s dream bike needing Triumph-twin power presumably one of Spain’s finest two-stroke engines is left propping open a door somewhere. However, fitting the considerably larger 1960 500cc Triumph 5TA engine was not without complication. Tony had to remove all the lugs from the frame, move the pivot point for the rear suspension swingarm and eventually make a new swingarm. This incorporated the chain adjustment mechanism for which there was no room inside the perimeter of the frame due to the size of the engine. Steering geometry was altered by lifting the back of the bike up and making new fork yokes which shorten the wheelbase slightly. The forks themselves are 35mm Marzocchi items dating from around 1970 and, as the bike is to be used regularly on the road, it is fitted with a 8″ diameter twin leading shoe front brake from a sixties BMW. The rear hub/brake is the original fitment. The Mk2 Metisse aluminium fuel tank nominally holds 3 gallons and was made in Southampton for the American market. The tank needed a new bottom to accommodate the different tube arrangement of the Petite Metisse frame hence the vagueness in capacity. The fibreglass seat base and mudguards are from a guy in Farringdon near Oxford who supplies the current Metisse builders. The colour is one of the original colours in which the bike was available when new. 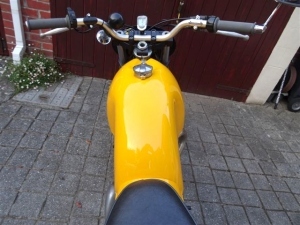 The bike was finished in January this year and received its registration number about three weeks ago. So far it has done about 150 miles whilst slowly whittling down the snagging list that is inevitable with any new build. Tony is obviously pleased with the results and reports that it is the nicest bike he has ever ridden. 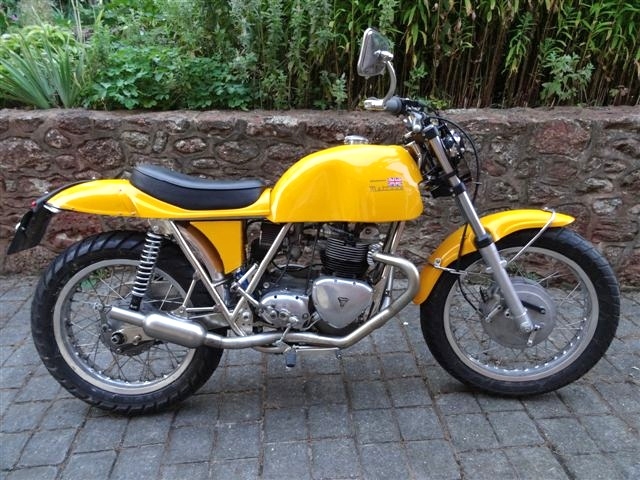 The light weight, short wheel base, pedigree chassis combined with Triumph power and decent brakes must make the bike a dream on back roads. I for one can’t wait to have a go some day. 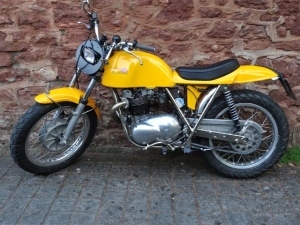 This entry was posted in Bikes and tagged Metisse, Triumph by Dodson. Bookmark the permalink.